In presentations for clients and various groups we use quite a few graphics to convey concepts related to social media. In the next few weeks I’ll be posting some samples and providing a bit of background on each graphic. 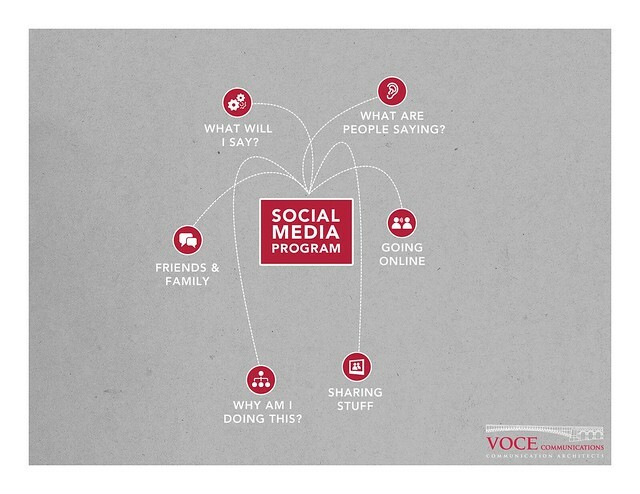 First up is a sample social media program diagram. 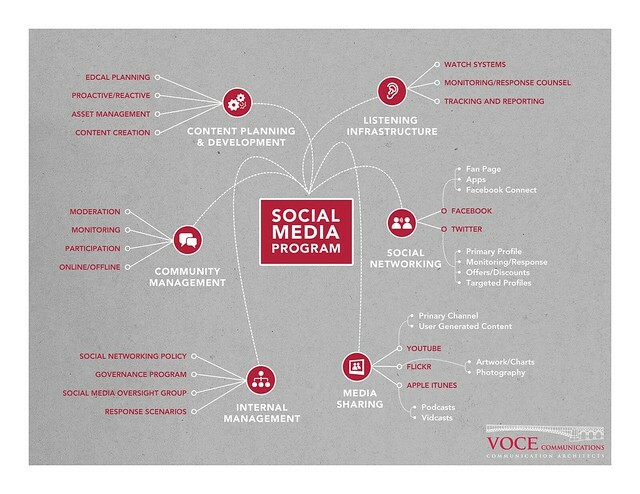 The primary purpose of this graphic is to showcase all the work that is required behind the scenes to manage a successful social media program. We’re certainly not proposing a one-size-fits-all approach with this graphic. Each organization has unique needs based upon their structure, goals and resources, but you get the point. Of course everybody gets excited about the public-facing activities like Twitter and Facebook, but how about exciting things like Asset Management and Governance Programs? The graphics doesn’t even begin to cover measurement functions or internal organization which brings another layer to the discussion. Clients that have been running effective social media programs for years typically have all these bases covered. We frequently see social media programs strain under the pressure of growth. Planning and documentation are key to managing growth and handling internal communications/expectations. Cross posted to Voce Nation.